The Blackhawks begin the quest for the Cup tonight. Going for the Cup with the Finals begin tonight. Once the puck drops at the United Center, both the Blackhawks and Bruins can finally play a game instead of talking about everything under the sun. Yesterday the NHL held its media day for the two teams and the players were questioned about everything. Most of the questions were about the goalie match-up, not facing each other during the regular season, winning the Cup in recent years and the style of play. A local TV news reporter asked players what their superstitions were before they play? Most players didn’t have anything colorful. Patrick Sharp said he kisses his little girl before he leaves his home. Brent Seabrook will join Keith as a new father soon. Keith also let the world know that Patrick Kane has a girlfriend. Game time cannot come soon enough. 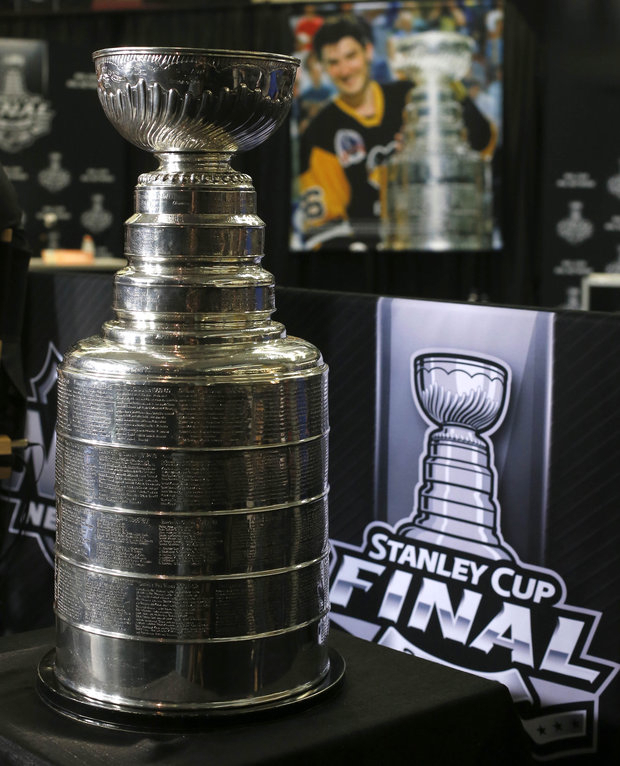 There was one item in the media room that impresses me anytime I see it: Lord Stanley’s Cup. It is still the coolest trophy symbolizing a championship. We got to see it here three years ago. Championship fever in Chicago has the usual touches: the buildings downtown are lit with Go Hawks signs and the Art Institute will put the Blackhawk helmets on its lions. People have Hawk flags on their cars and jersey and T-shirt sales are brisk. Don’t ask the NHL to be a travel guide for Chicago visitors. They have shipped the traveling media to hotels in Gurnee. That nice long commute is one way to tick off a writer from Boston. I guess if they want to go shop at Gurnee Mills or go to Great America on their off days it wouldn’t be so bad. But still, Gurnee?! How dumb can a player be for using 140 characters to get a team mad enough to suspend you and likely get rid of you? That is what Cubs third baseman Ian Stewart did late Monday/early Tuesday. The often injured Cub is disgruntled toiling in the minors. He ripped the team&apos;s management and specifically manager Dale Sveum for keeping him in Iowa. The irony to his situation, Sveum told the media he was considering bringing him up to the parent club. That is not going to happen. Instead Cubs President Theo Epstein has suspended Stewart and is working out his future situation, probably a one way ticket out of the organization. Stewart did tweet out an apology. The Cubs are using the loyalty clause to support their decision. I suggest one thing for players: if you use Twitter, think before you tweet. Had to ask Theo about the Cup. He is from Boston and wouldn’t say who he is rooting for in this series. Got a feeling he has hopes for the Bruins. How often do the Bears hold a mandatory mini-camp and it does not lead the Chicago sports media? Almost never. Guess the Hawks own Chicago right now.